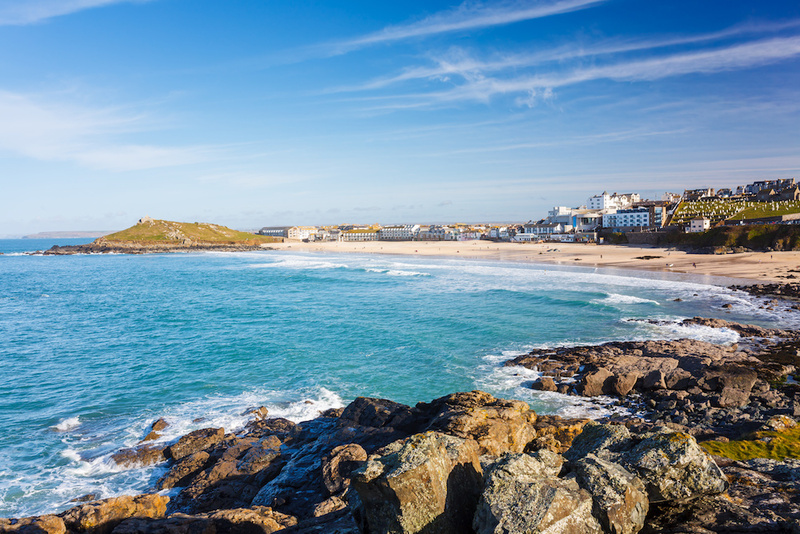 There are only eight Blue Flag beaches in Cornwall, but that isn’t the reason why Porthmeor Beach is a crowd favorite. This beach is famous among locals and tourists alike because it is right in front of the Atlantic Ocean. Porthmeor Beach is a must-see whenever you’re in Cornwall because it was given the Blue Flag distinction. This means that Porthmeor Beach passed the highest standards in terms of water safety, cleanliness, facilities, and environmental management. For a beach that gets a lot of tourists every year, Porthmeor Beach proves that it can maintain its beauty and still offer interesting activities to people around the world. Located at St. Ives, Porthmeor Beach is found right in front of the Atlantic, its back turned to local shops, galleries, and restaurants. It’s also the view of the Tate Gallery in St. Ives. Porthmeor Beach is home to waves and fine sand. Because of the waves, it is a famous surfing spot for beginners and professionals alike. There are also surfing schools around the place that offer surfboard rentals. Just nearby is what people call “The Island” which is in between the harbor and Porthmeor Beach. If you want to get a great shot of St. Ives, this is definitely the best spot to be. Because Porthmeor Beach has a Blue Flag title, rest assured that the area is filled with well-maintained public toilets and parking lots. The beach also has lifeguards to ensure everyone’s safety. To add to that, dogs are allowed on the beach except for the dog ban happening from March to September. Again, Porthmeor Beach stands out among the other 7 beaches in Cornwall because of another reason – the waves. This beach offers one of the best surf spots in the area and tourists are always welcome to take surfing lessons at St. Ives Surf School. The school is right along the shores and it’s one of the most trusted surfing schools for beginners. While you’re in the area, you might also want to visit the Tate Gallery which is just a few steps from the shore. The Tate Gallery features mostly contemporary art and local artists such as Alfred Wallis. You can also book a reservation for dinner at Porthmeor Beach Cafe, one of the most delicious cafes in the area. Although they don’t accept reservations during breakfast and lunch, you are free to do so during dinner while you watch the sunset or the stars that twinkle over the ocean. St. Ives offers a wide range of tourist destinations perfect for all kinds of travelers. If you want to go somewhere high-class, then you can take a trip down Fore Street. Fore Street is home to designer shops and fine dining restaurants. The place is also so pretty, you might as well take photos of every establishment. There’s also the Porthgwidden Beach where you can experience hiking with your bare feet! Once you reach the top of the place, you can let your foot rest along the rocks and watch the whole scene of shore, water, and town create a beautiful landscape.